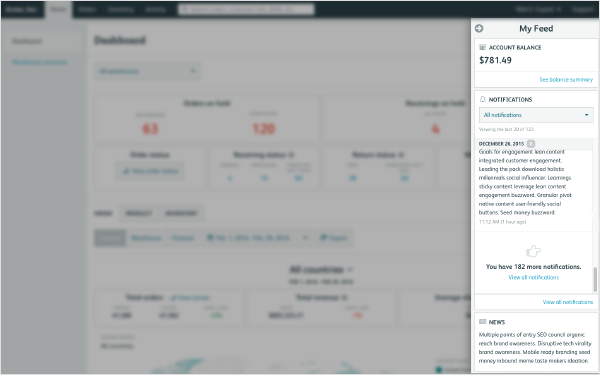 The Shipwire Platform Dashboard is the go to location to keep a steady pulse on your supply chain. From extensive customization capabilities to predictive analytics, leverage the Dashboard as a control tower to surface critical insights and trends and isolate your key business drivers. 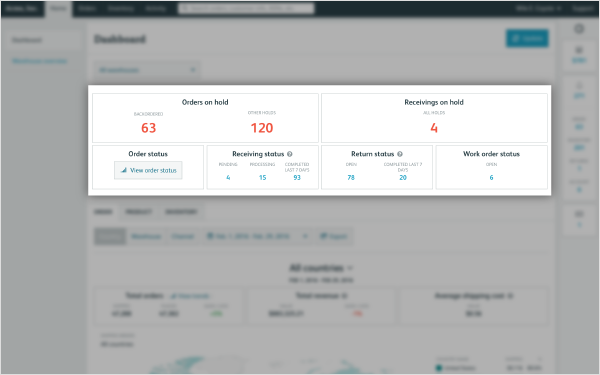 The Shipwire Platform Dashboard is split into 3 main sections to best support your day to day activities. The Control Tower view of the Dashboard breaks down all the high priority information that is recommended for you to take immediate action on. This enables you to stay on top of issues as they arise in your supply chain. 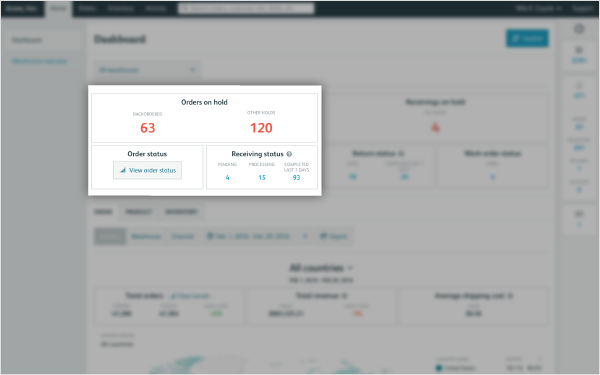 Orders on Hold module: The Orders on Hold module brings to attention what’s slowing down your product getting into the hands of your customers. By clicking on the “Other Holds” number, you can see a list of your holds categorized by reason. 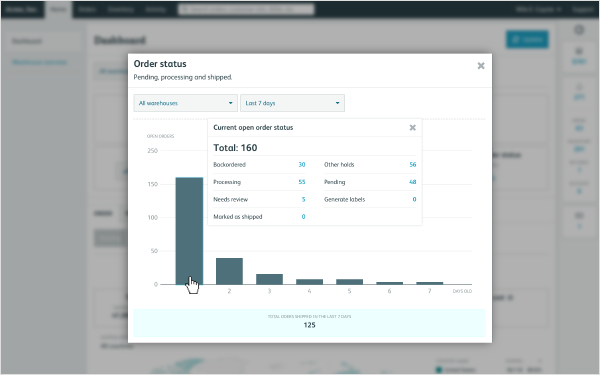 Receiving Status: Understand where your incoming inventory is by seeing your pending, processing, and completed counts. Receivings on Hold: The Receivings on Hold module brings to attention what’s slowing down your product getting into our warehouses. Return status: Understand how many open returns you currently have any how many have been completed and put back in your inventory. Work order status: View the open count of your special projects and work orders. The Side Feed View surface items that can be browsed at your earliest convenience. Reference this view to read up alerts that do not require any immediate action such as inventory arrivals and returned items. Account Balance: View your account balance and summary as well as easily manage your payment method. 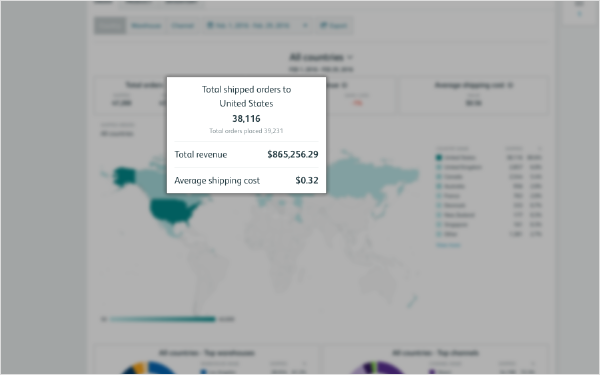 The analytics view of the Dashboard provides comprehensive data points to answer where your orders originated from, where they were shipped to, what channels they originated from, total revenue generated from orders, as well as average shipping cost per order. Leverage the Country view of the map to understand where your shipped orders are placed and end globally in different time frames and regions. 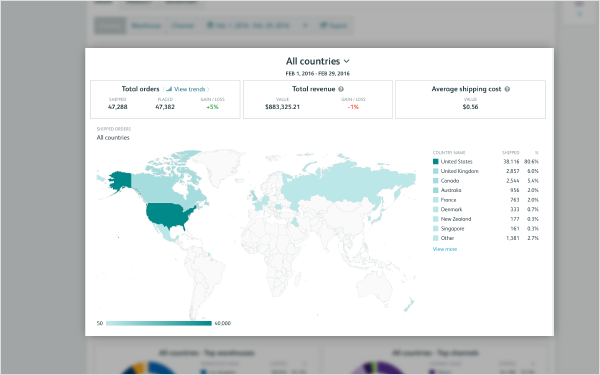 The Warehouse view of the map breaks down all amounts shipped vs. placed from all of your locations or specific ones of your choosing. 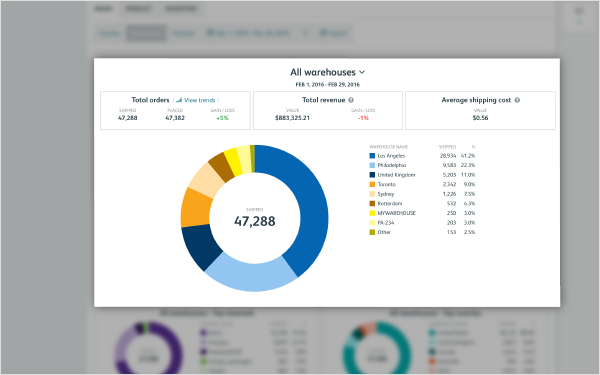 From there you can easily find out the average cost of each shipment and also the overall amount of shipment from each warehouse. 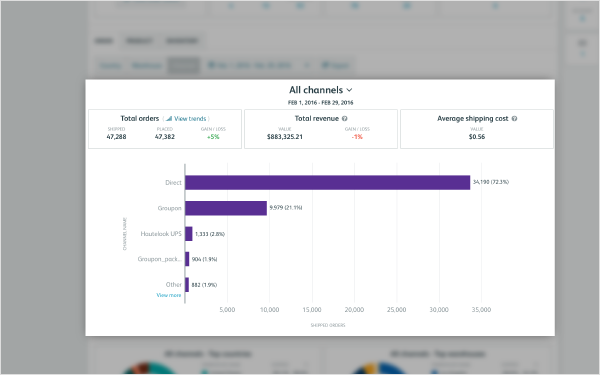 The Channel view of the map aggregates all your sales channels and their performances based on your shipping data visually. These graphs can further be split to isolate specific time frames and regions.